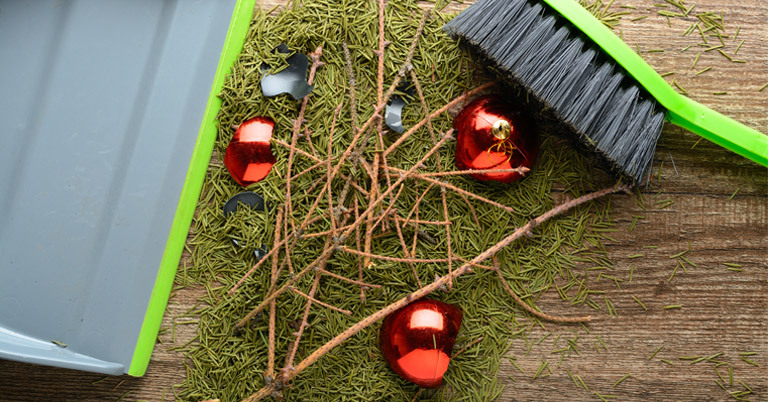 When the festive fun is over and Christmas is but a distant memory, it’s time to look ahead to the big New Year clear-out. Start 2019 as you mean to go on with a clean-up of your home and garden. There’s nothing worse than starting a new year with clutter and most people find it very invigorating to get rid of all the junk that has accumulated, not only over the festive period, but throughout the past 12 months too. It’s time to get rid of all the rubbish that’s been hiding in your shed for the past 10 years! Over the festive period, you will probably have amassed plenty of rubbish. If you’ve been partying, there will be the associated waste, such as empty bottles, cans and maybe paper plates from a buffet. You’ll also have lots of empty cardboard boxes, packaging and wrapping paper. With recycling bins filled to capacity, it’s time to take your waste to the local recycling centre. This also includes your Christmas tree, if you’ve had a real tree. Check with your local council where you can recycle trees. Anything that’s completely unsalvageable can be taken to your local tip. No-one wants to start the New Year with their wheelie bin overflowing with rubbish and extra bags sitting in the garden for the local cats to rip up! Once you have all your waste bagged up and ready to go, hire a van to take it all in one trip. This is a vastly superior way to transport your rubbish, as opposed to packing it into your car and probably having to make several trips, which will take up more of your time and money in fuel costs. It’s a good time to get rid of old and unused toys and games during your New Year clear-out. The best thing to do is to give them to charity shops so that someone else can benefit from them – after all, one man’s junk is another man’s treasure! Check in your garage and shed too and be brutal – if you’ve been hanging on to the kids’ old bikes, or any other items from their childhood, such as old buggies, tricycles, ride-on pedal cars or larger items, give them away too and clear some space. Again, hire a reliable van, so you can fit all the toys and other items inside and get rid of them in one trip, even if it involves stopping off at several different shops en route. Most charity shops will take good quality toys, board games and books. With larger items, such as bicycles, you may be able to sell them to a second-hand dealer and make yourself some extra money, turning your trash into cash. While you’re in the mood for clearing out clutter, why not sort out your garden as well? It could be a brilliant new year’s resolution to give your garden a tidy-up in time for spring. If you’ve already done your house, garage and shed, the garden is the final piece of the jigsaw to give your home a fresh new feel. At the very least, you can dead-head any old flowers and bushes ready for them to bud again, weed the flower beds, lawn and pathway and cut back any plants that have been left to their own devices for the last few years. Hiring a van will enable you to bag up all your garden waste and take it to your local tip or recycling centre, where there’s usually a specific skip for green waste. Make sure 2019 gets off to a clean start by organising your own big New Year clear-out, with help from H&H Van Hire. Be sure to hire a reliable van for a convenient and cost-effective means of clearing out the clutter. Please contact us for further details.